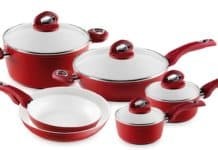 The ceramic cookware is both nonstick and smooth and are available in different colors and sizes. Both the colorful exterior and usually pale interior can become stained and dingy, however a regular proper cleaning is critical to keep them bright. 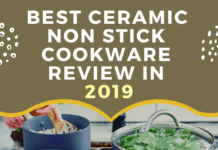 The good thing about ceramic cookware is that they don’t leach harmful chemicals into your food. They help prepare healthy foods quickly. They are easy to maintain and clean. Always clean after each use to help them maintain their original luster. If you don’t clean them after each use they may be a breeding ground for bacteria and germs. So be sure you clean them regularly. 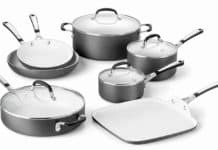 Ceramic coated cookware are mostly non-reactive and do not leach chemicals into your foods as we have seen above. This therefore makes it easier to clean them and keep them in good shape for years to come. 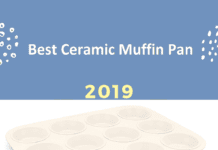 Basically ceramic cookware is the popular alternatives to the traditional nonstick cookware. This is a worthy investment despite its high cost as they will last a lot longer. It performs perfectly and remains a better choice for many people. 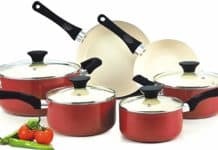 But with proper care, cleaning and maintenance, you will definitely extend the life of the cookware and use it for long time. 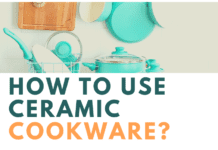 Some of the product you may need as you prepare to clean up your ceramic cookware include the following; baking soda to help in breaking up the stubborn stains and scratches. It will also help in breaking down the grease. Hydrogen peroxide is also another important substance that removes all the burned food on the cookware perfectly. Vinegar too has an acid that breaks down the grease on its own. When you combine it with baking soda, it will help removal of extreme burned food from the cookware. Other important products you need for better cleaning are; enzymes and acidic solutions, plastic scrubbing brushes and clean hot water. Use a soft towel for dry cleaning your pan. Start by soaking the cookware in hot water for half an hour to remove the burnt food easily. When you allow this pan to soak, it will help in loosening up the burnt food and makes it easy to remove it with a cloth or sponge. For difficult burnt food, you can add one cup of vinegar and four cups of water to the pot and allow it to boil over a very low temperature. Let it boil for about three to five minutes and then turn your stove off. 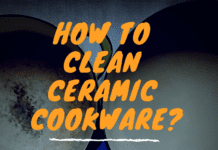 After this solution has cooled down, you can then start scrubbing your cookware gently. Ensure that you allow vinegar to bubble away from the pan before you scrub. Scrub it softly with soft cloth or sponge. You can also use hydrogen peroxide instead of vinegar for easy removal. Avoid using nylon, steel wool or any other abrasive materials on the pan because they can easily damage the coating layer of the pan. No need to apply a lot of pressure because the cleaning power of the vinegar will remove the stains easily. Rinse the ceramic pots thoroughly in warm water. Make sure that you rinse off all the food particles that were left while washing. Repeat washing again this time using soap and water before you rinse the cookware again. As you rinse the item, check properly to see if there is any stain or burnt food that is left on the pan. Confirm properly and then rinse it until it is completely clean. For tougher stains, sprinkle the ceramic cookware with the baking soda. While your cookware is clean and wet, you can generously sprinkle a small portion of baking soda around the stained area. Let the baking soda sit for around 15 to 20 minutes, and then scrub the cookware again in circular motions using the plastic brush or soft bristled dish brush. Rinse it again in warm water and then dry it thoroughly. 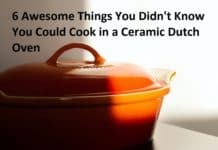 Allow your ceramic cookware to dry completely. You can use a clean paper towel or dish towels to dry your pan after washing and rinsing it. Or you can just let them air dry on the drying rack. Make sure you wash the ceramic pans or pots in warm and soapy water before using it on the first time. This will help to remove all dust and any particles on the item. Use proper cookware materials when washing your pan to avoid damage. Use butter or oil when cooking the pan to protect the pan. This helps in coating the pan evenly. It also helps to prevent food from sticking on the pan. This ensures that food does not get burnt-on in the pan. Cook your food at low or medium temperature so that food does not stick on the pan. 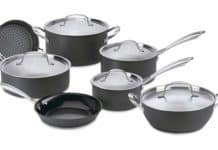 High temperature cooking may lead to discoloration and damage of the pan. It is also important to allow the pan to completely cool down before cleaning it. 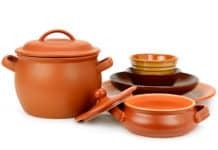 Ceramic cookware products are pleasing and super easy to clean and maintain. With proper use and maintenance of the item, you will definitely increase the life of the product. If you don’t pay proper attention to the maintenance the pan, it will get damaged quickly. Regular cleaning is very important. 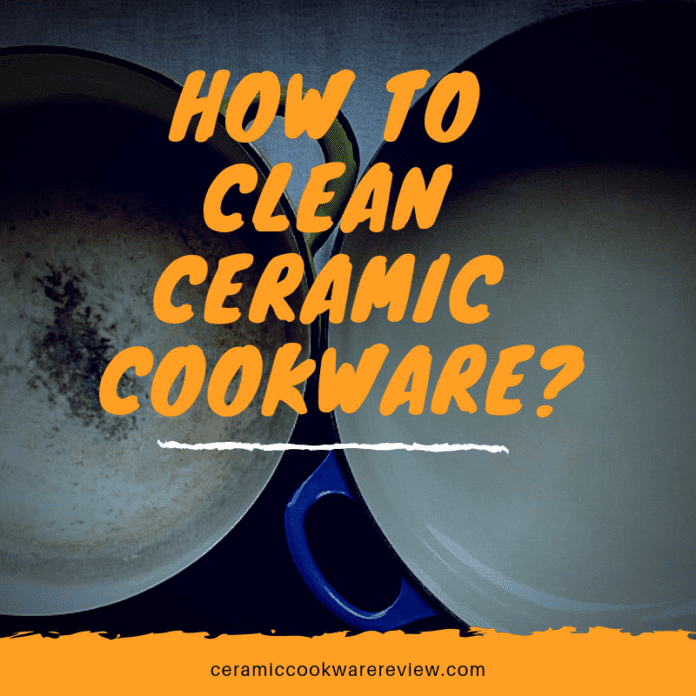 As we have seen it is important to clean the cookware after each use. It will payoff in the long run.